The Arno Black Marble Adult Cremation Urn is a natural marble urn with a body that tapers to a narrower base. This sophisticated polished black marble urn can be almost pure black but often has some medium to dark gray veining or even white veining running through it. Due to the nature of natural stone, the color variations will differ with each urn, making each urn very unique. We cannot promise your urn will have more of a certain color or veining. The lid sits on top and is not threaded. The lid can be temporarily sealed using QuakeHold putty or get, or it can be permanently sealed using any household epoxy such as Gorilla Glue or Krazy Glue. 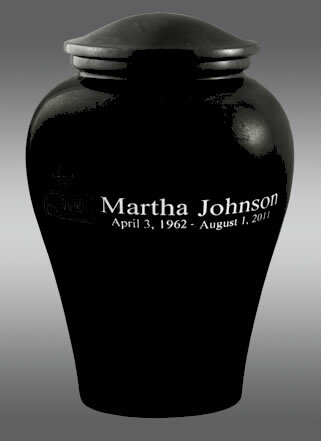 This urn can be engraved with name and dates or name and a short sentiment for an additional fee. 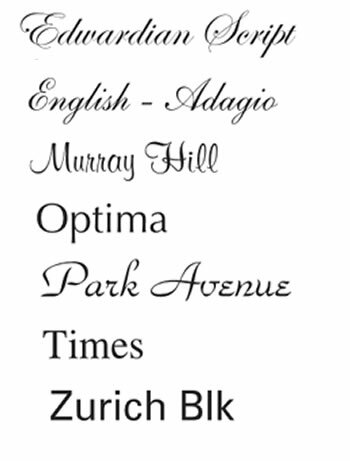 Click on the tab titled Detailed Images to view font selections and an engraving example. Please limit engraving to no more than about 30 letters per line. The more letters per line, the smaller the font size will be. An engraving proof will be emailed for your approval prior to the urn being engraved. Please allow 1-2 business days for engraving before urn ships, even for orders with expedited shipping. 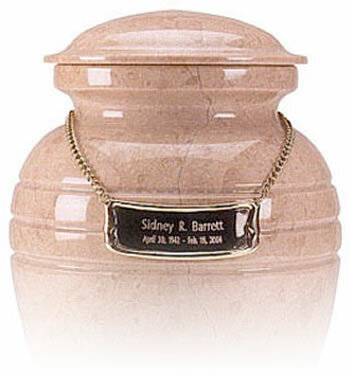 Another way to personalize this urn is with an engraved Medallion Name Plate that hangs on an adjustable chain around the neck of the urn. Click on the tab titled Detailed Images to view the Medallion Name Plate. The only font choice available for the name plate is what is shown in the sample under Detailed Images. The black name plate with a polished brass border measures 3 1/5" x 1 1/4". Please limit engraving to no more than 25 characters/spaces on the first line and no more than 30 characters/spaces on the second line. Engraving proofs are NOT available for name plate engraving. Please be sure spelling and dates are correct when you submit your order. Engraving on name plate is done in Times Roman font. Holds approximately 215 cubic inches which is large enough for most people with healthy weights less than 210 pounds.